You have golden eye makeup and you look dazzling with sparkling lights all around you, your lips are a moist, pinkish colour and your sparkling fingertips are elegantly grasping a champagne glass. You are having a sparkling good time because the end of the year is near and Laneige is throwing a fabulous sparkling party. It’s The Season To Be Sparkly and let’s party to celebrate the end of 2014 and welcome the new 2015. In celebration of the much-anticipated Christmas and New Year holidays, Laneige is introducing its exclusive Holiday Collection sets. The 2014 Holiday Collection will have the ladies torn between getting the bestselling BB Cushion, a Basic Care Kit, the Water Sleeping Pack or a spanking new makeup palette. Take your pick at any one of these sparkling choice sets or if you can’t decide on just one, spoil yourself a little more this holiday. That’s not all! 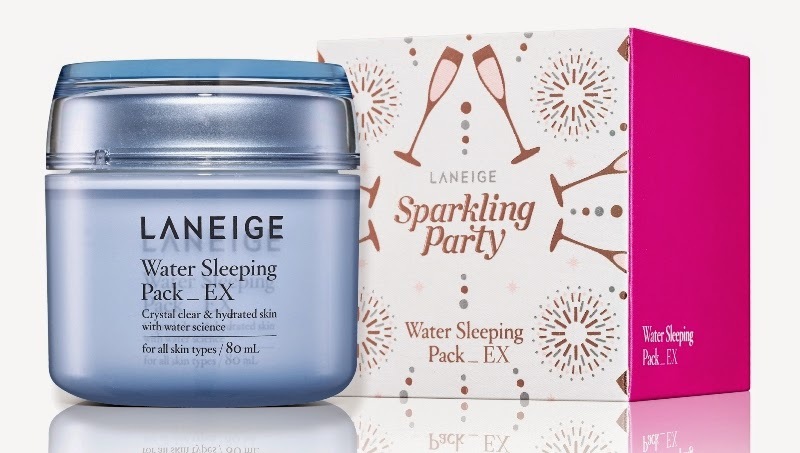 While you are sleeping away your tiredness at night, put on the Water Sleeping Pack to instantly brighten the skin tone and experience the intense moisture on your skin while you sleep. It also helps the body feel relaxed more easily with SleepscentTM which promote greater revitalization of the skin when the body is in a relaxed, resting mode. Wake up the next morning with no traces of the crazy time you had the night before. 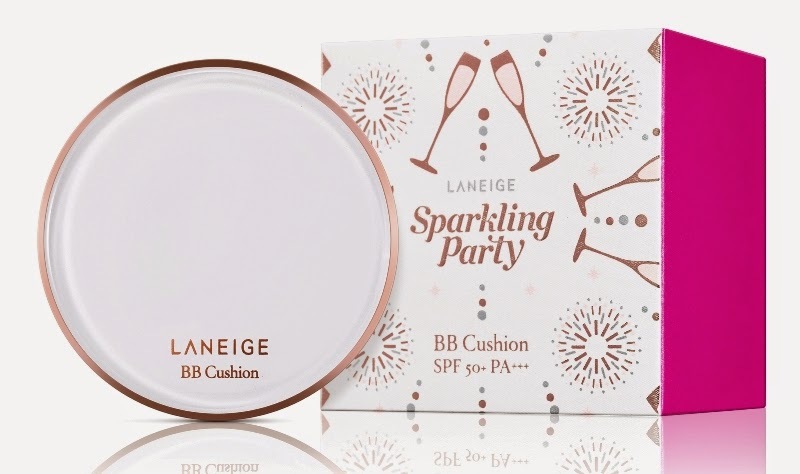 The BB Cushion for the Holiday Collection comes in a new limited edition design to match your party look. Fashioned in White Pearl coating on the front plate and Rose Gold coating on the side, the Laneige bestseller will not only prep your skin for the night but will also work to conceal blemishes and brighten the skin too. With a good foundation for your skin, you’ll be set to glitter for the rest of the night. And who knows? You might even bag the ‘Best Dressed’ award for the night. The star of the range, the Sparkling Party Makeup Palette is all you need to look fabulous for the festive season. New and in limited quantity, the Sparkling Party Makeup Palette will feature glitter nails and glitter shadows besides the ever popular Water Drop Tint in Neon Pink and Raspberry Pink. Buy this as a gift or get one for yourself this Christmas. The Sparkling Party Makeup Palette box sleeve comes in an exclusive festive design. Surely a holiday set would not be complete without a bright and cheery Christmas packaging. 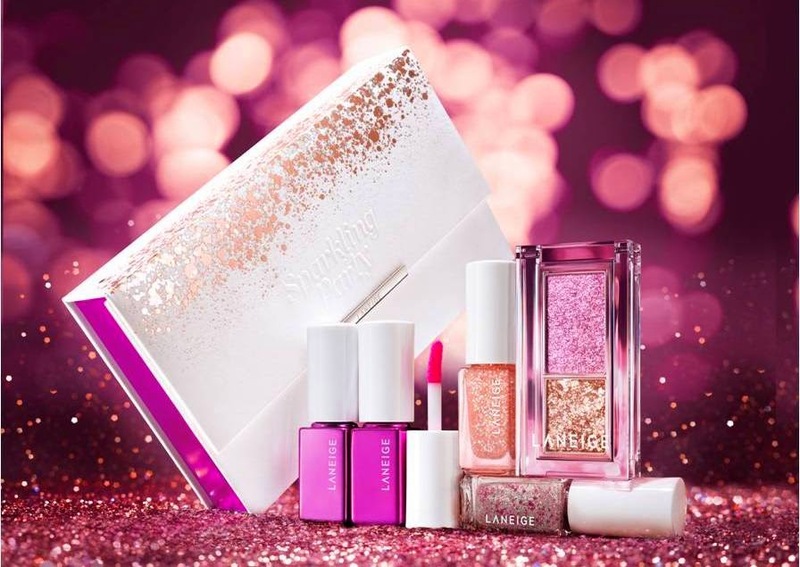 Apart from that, the Laneige Sparkling Party Holiday Collection will also feature 9 Special Sparkly & Glitzy Sets / Laneige 2014 Holiday Collection Sets which include Laneige’s bestselling skincare range and BB Cushion sets.